Mount Parnassus, also Parnassos, is a mountain of limestone in central Greece. It is north of the Gulf of Corinth. According to Greek mythology, this mountain was sacred to Apollo and the home of the Muses. Mount Parnassus is named after Parnassos, the son of the nymph Kleodora and the man Kleopompus. Parnassos was leader of a city that was flooded by rains. The people ran from the flood up the mountain slope. There the survivors built another city and called it Lykoreia. According to some traditions, Parnassus was the site of the fountain Castalia and the home of the Muses. 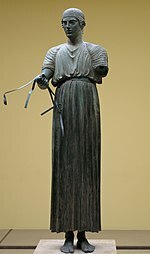 As the home of the Muses, Parnassus became known as the home of poetry, music, and learning. Parnassus was also the site of several unrelated minor events in Greek mythology. In some versions of the Greek flood myth, the ark of Deucalion comes to rest on the slopes of Parnassus. This is the version of the myth told in Ovid's Metamorphoses. Orestes spent his time in hiding on Mount Parnassus. Parnassus was sacred to the god Dionysus. The Corycian Cave, located on the slopes of Parnassus, was sacred to Pan and to the Muses. In Book 19 of The Odyssey, Odysseus tells a story of how he was gored in the thigh during a boar hunt on Mount Parnassus in his youth. Parnassus was also the home of Pegasus, the winged horse of Bellerophon. Today, the slopes of Mount Parnassus have two ski centres. The Parnassos Ski Centre has two sections, Kellaria and Fterolakka, which together make up the largest ski centre in Greece. A smaller ski centre (only two drag lifts) called Gerontovrahos is across a ridge from Kellaria. Parnassus is mined for its large supply of bauxite. The bauxite is converted to aluminium oxide and then to aluminium. ↑ 1.0 1.1 1.2 "Europe Ultra-Prominences" Listed as "Liakoura". Peaklist.org. Retrieved 2012-02-19. This page was last changed on 22 March 2014, at 02:24.